Children in First Grade and older who have yet top make their First Communion are invited to participated in one of the upcoming classes to prepared them for this special moment in their lives and in the lives of their family. The classes, which will be held after second service on a Sunday, will include making bread, learning about the sacrament and practicing the right things to do and say during Communion. The date for the second class 4/14. It will run about 90 minutes in length and a Parent or Godparent is required to participate through the class with their student. First Communion Sunday is May 5, 2019. We are excited to be a part of this moment in the lives of our children! SSLC offers teaching and public recognition regarding participation in Holy Communion as a milestone of faith formation. Children in First Grade, as well as older children who have yet to make their First Communion, are invited to participate in a hands-on class in the weeks leading up to First Communion with a parent/sponsor. Families with children younger than that who wish to begin instruction for their child can speak directly with one of the pastors about possible exceptions to our policy. First Communion will be held the second Sunday after Easter at both the 8 a.m. and 10 a.m. Worship Services. We are moving it from Maundy Thursday to allow families the opportunity to more easily invite and have family members who live at a distance participate in this important moment. First Communion Instruction usually takes place sometime during the season of Lent. Sunday, March 31, at 11:30 am am OR Sunday, April 14, at 11:30 am. Creation—Genesis 1, especially noting HOW God creates. What is it that is important to YOU about what happens at communion? What words do you hear in worship around Holy Communion that are important to your heart? 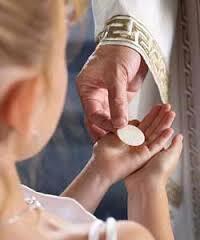 What are some of your earliest memories about Holy Communion? What are some questions that YOU have about Holy Communion as an adult? First Communion Recognition & Blessing- May 5, at both 8 am and 10 am worship. If you have any questions or would like to talk to Pastor Mike prior to instruction, please indicate that here. "Let the Children Come to Me: A curriculum for Holy Communion for Households with Pre-Readers"
HERE IS THE PRE-READER CURRICULUM WE USE HERE. ​HERE IS THE CURRICULUM WE USE HERE.